Yesterday, the South China Morning Post published an article by Sam Agars titled, Team China show their AFL spirit by playing Hong Kong Dragons. The original article can be viewed by clicking here. It is also reproduced below. On the biggest day of the Australian Rules Football calendar, the Australian Football League’s grand final day, Hong Kong got a first-hand look at the sport as it continues to grow in China. 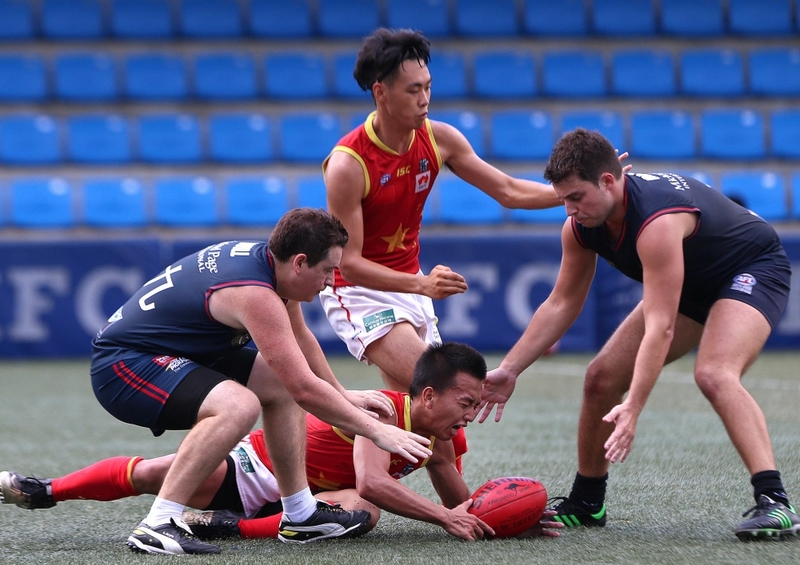 As part of their partnership with AFL side Port Adelaide, Team China are visiting Hong Kong, fresh off their first international victory at the AFL International Cup in Melbourne last month. China and the Hong Kong Dragons played out a precursor to Saturday’s AFL decider between Sydney and Hawthorn which saw the Dragons win 8.7 (55) to 5.6 (36), before the Chinese team were guests of honour at Hong Kong Football Club’s grand final lunch. The Dragons proved too skilful and smart for the speedy and agile Chinese. Australian Rules was first played in China in 2006. “In the beginning, it was a chance to go abroad, know more foreigners and practise English,” Team China manager Zhang Hao said. According to Zhang, there are between 100 and 200 players in Guangdong, with the majority of Team China studying at the Guangzhou Sport University. China has two teams in the South China AFL – the Guangzhou Seagulls and the Guangzhou Scorpions – with most of the Chinese international side sourced from the Scorpions. Despite growth remaining relatively slow, Zhang has high hopes for Aussie Rules in China. “I hope in future we can find some talented players that can maybe play in the AFL [in Australia],” Zhang said. Port Adelaide has identified the potential of expanding its brand into China after creating an affiliation with Team China earlier in the year. “Our strategy, put broadly around the club, is that we want to grow our brand and grow our business,” said Port’s general manager of marketing and consumer business Matthew Richardson, who was present at the match. “Team China is self-funded and they didn’t have enough money to come to the International Cup, so we sponsored them and brought them to Australia. The Dragons, founded in 1990, have over 70 playing members and have three sides that play in the six-team SCAFL, with the main season running between January and June. To see more articles about AFL Asia’s clubs that have been published in the media, click here.